Any trip into your local hardware store will prove there are many deck stains to choose from. But when most people do a search for “deck stains near me” they are mostly looking for a quality type of deck stain. They are perhaps looking for a stain that will last longer than the stain they bought and used locally. Well if that is the case, searching online for deck stains near me can result in a treasure chest of great information and stain products. A deck stains near me search will enable you to find an authorized online dealer. What exactly does this mean? Well an authorized online dealer means they can sell deck stains that they have authorization to sell directly from the manufacturer. So quality brands like TWP, Defy, Armstrong Clark, IPE Oil, Messmers, etc. can be purchased and shipped directly to you from our website. Most online dealers offer free shipping as well as tons of information on the products they are selling. Some even offer how-to articles and Q&A sections to help you along with your wood-staining project. This is an excellent way to educate yourself and to get professional like results. Through an authorized dealer you can also be covered under the manufacturer’s warranty just like you bought it directly. It is also a plus to be able to read reviews and testimonials of a particular stain before you make a decision. Online dealers will also have in stock many brands and all the colors and tones available. Even many of the big box stores that may carry a quality wood stain cannot stock all the available colors simply because they do not have the space. They can only stock the most popular colors and tones. Many popular oil and water-based brands of deck stains can be shipped to all 50 states. Check the compliance of your state first just to be sure. Search for “’deck stains near me” and find an online authorized dealer that can ship you the quality deck stain of your choice. Get the best prices and offers as well and buy with confidence. You will be happy knowing you find a quality deck stain that is going to give you the results you expect. I live in northern Texas Panhandle and I have installed a cedar fence which I want to stain a cedar tone. I am wanting a good quality stain that will withstand the hot sun and UV light. I have a neighbor that has treated his new cedar fence annually the last 3 years that has developed a lot of gray to black tones due to the UV light. I want to avoid a similar result. We live ihouston. Have de k of treated pine and pergola of cedar. Want a brownish tone deck stain nott orange, yellow or red color. A semi transparent to absorb notcoat wood lije paint. What are the most durable stains? And where can I buy it near me in houston or? I notice that you don't mention Wolman products when discussing quality stains, even though it's sold on your site. What's your take on this company's F&P stain? Wolmans FP is not a quality stain like it used to be. 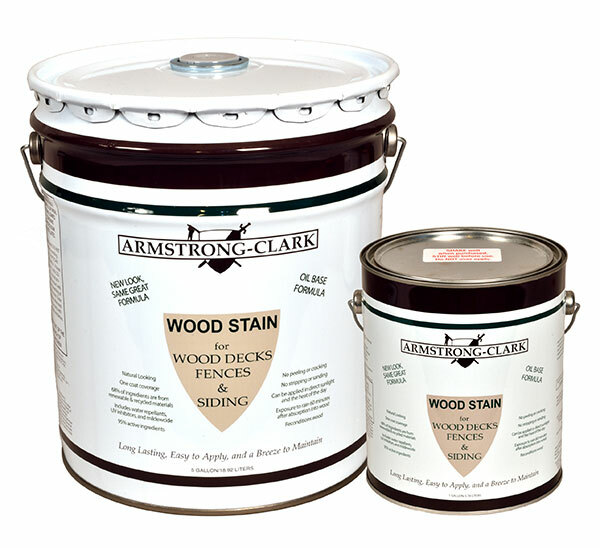 Armstrong is only sold online through our website to Canada.